Wind can really be a bummer. You’re having an otherwise pleasant day, when all of the sudden, your perfect hairdo is ruined because a gust of wind randomly hit you. Frustrating right? It’s true, but compared to the record-breaking windchill temperatures that the midwest is experiencing this week (down to negative 60 degrees Fahrenheit in some places! ), the scenario we just described is, quite literally, a breeze. When a college in the midwest is closed because it’s far too cold outside, you know that things are real. While your primary objective as a Kent State University student is to hit the books and study whether or not class is canceled, it certainly doesn’t hurt to take this “free day” and make the most of it by relaxing and recharging before we get deep into the spring semester. Might as well, right? We’re willing to bet that students will also get Thursday off as the wind chill is forecasted to persist until then, but we’ll see. 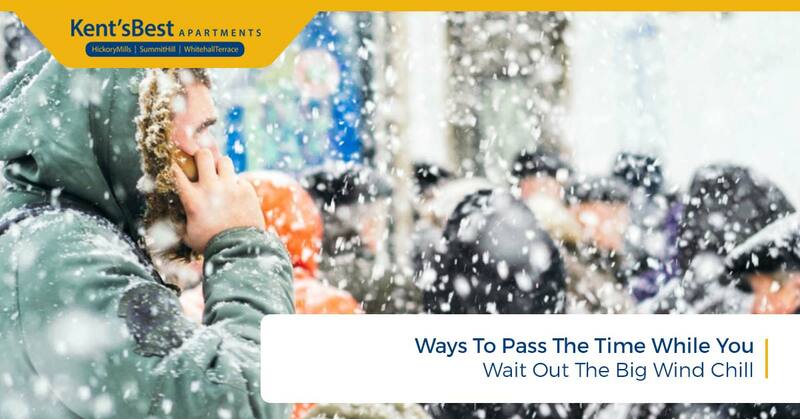 In any case, here are some great ways to buckle down and pass the time when it’s simply too cold out for class to be in session. Most Importantly: Do Not Go Outside! Thinking about braving the cold? Want to show all of your buddies how cool and tough you are by taking a Snapchat walking around an empty campus? Don’t. Though our temperatures won’t get down nearly as cold as -60F, Kent will still endure temperatures that will give your skin frostbite with only a few minutes of exposure. That’s some serious stuff right there. If you absolutely must go somewhere to get food that’s somehow open during this storm, you better be dressed head to toe (including your face!) in extremely warm, waterproof, and insulating gear. We’re talking about donning essentially every single winter clothing item that you own. We’ve all been there when a friend excitedly asks us, “Hey, have you seen [insert film here]?” When it’s a classic film that you’re familiar with but haven’t seen, you’re inclined to lie and say “yes” because admitting that you haven’t absorbed an essential work of pop culture would just be too embarrassing. Well, with class canceled today and potentially (hopefully) tomorrow, you finally have some time to catch up on these iconic films. Should you be studying? Yes. Are you going to study knowing that there’s absolutely zero academic instruction occurring on campus? No. Go ahead, take the time to watch Forrest Gump and 12 Angry Men. You’ll finally be able to answer these dreaded questions truthfully — all you’ll need to do is watch 8,346 more films! Let’s do a quick 180 here. Instead of focusing on what other people have asked you or said to you, why not take this particularly quiet day in Kent to put on some calming music and focus on your breathing? Meditation has many proven benefits, and it doesn’t have to be associated with a particular religion or even spirituality. Simply calming your mind will help prepare you for the rest of the semester when it’s time to pick up the books again. These days, most people spend too much time looking at a screen in one capacity or another. Save your eyeballs a little strain by diving into that novel you’ve been putting off. It’s a great way to expand your vocabulary while giving your brain a break from thinking about schoolwork. Sounds great to us! Remember the days of hosting LAN parties and having your friends come over to split your TV screen four different ways so that everyone could play? These days (and this is hardly anything new, of course), all you have to do is get online and join your buddies remotely. If skipping class and gaming makes you feel guilty (and it should, you’re here to learn! ), take advantage of this random day off. There it is. Out of anything that Kent State University students (and all college students affected by the wind chill) could possibly do during this downtime, sleeping in and napping is going to be the most popular. If you’re already tired to staying up late to study and waking up early to make it to class on time, this mid-week class break could be exactly what you need to refresh your body and mind. We’re sure that those in the dorms may partake in certain adult beverages, but we’re not going to place a value judgement on that. If there’s anything that Kent’s Best Apartments can do to make your stay more comfortable, please let us know. Remember to stay safe and remain indoors!